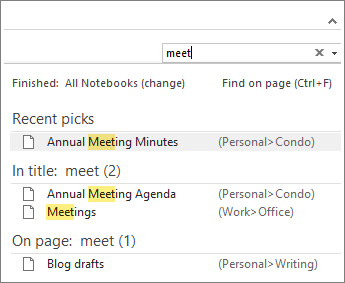 One of the main advantages of using OneNote instead of traditional notebooks is its ability to quickly search through all of the information you've collected and retrieve important notes based on criteria that you specify. Instead of having to flip and skim through paper pages, you can quickly retrieve anything you've jotted down. OneNote also makes it easy to browse through your most recent notes and search for spoken words in recorded audio notes. In the search box to the far right edge of your section tabs, select the arrow to the right of the magnifying glass icon, and in the list that appears, choose All notebooks. Note: If you prefer using keyboard shortcuts, you can press Ctrl+E to expand your search to all notebooks. In the search box, type a keyword or phrase. As you type, OneNote begins returning page results that match your search word or phrase. Choose a search result to retrieve the matching note. When you’ve finished your search, press Esc. If you want to narrow the search scope, select the arrow to the right of the magnifying glass icon, and in the list that appears choose how to limit your search: Find on This Page, This section, This Section Group, This Notebook, All Notebooks. To cycle through a large number of search results more easily, adjust the search scope, sort your search, you can pin the search results pane. Simply press Alt+O. OneNote can recognize spoken words in audio and video recordings if Audio Search is turned on. This option is turned off by default because it slows down searching. Choose File > Options > Audio & Video. Under Audio Search, select the Enable searching audio and video recordings for words check box and click OK.